"The Portland is a lovely, comfortable, beautifully furnished apartment. The private patio garden is perfect for enjoying coffee in the morning and drinks in the evening...a peaceful oasis. 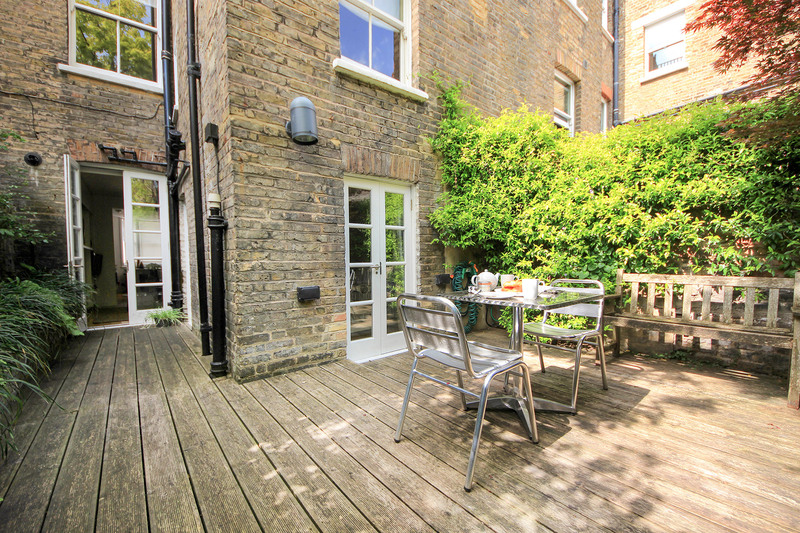 The apartment is located on a quiet street in Chelsea, just a couple of blocks from the bustling King's Road for shopping (including two great supermarkets: Waitrose and Marks & Spencer), and about a 15 minute walk to the Sloane Square tube station. The neighborhood is fantastic to explore, and a short distance to stroll along the embankment of the Thames. Location, location, location. Our charming and helpful greeter, John, recommended a nearby pub, The Surprise, which became one of our favorite spots, along with enjoying the cafe at Bluebird, the Antelope, and the marvelous gastro-pub on Walton Street, The Enterprise....all within walking distance of the Portland apartment. We also discovered a nice spot for lunch on nearby Sydney Street called Bumpkin. Honestly, we enjoyed every minute of our week in London, made "perfect" by our stay at the Portland apartment. We cannot wait to return! Thanks to everyone at London Perfect. And thanks, also, to the excellent car service provided by Lushi."